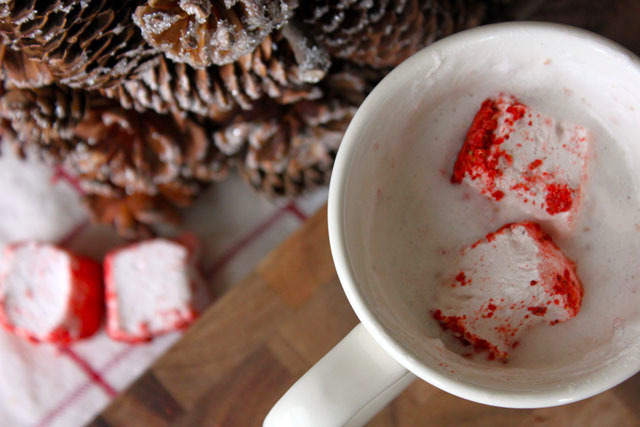 Snowflakes fell from the sky all weekend in my neck of the woods; it was a good reason to drink a mug of hot milk. 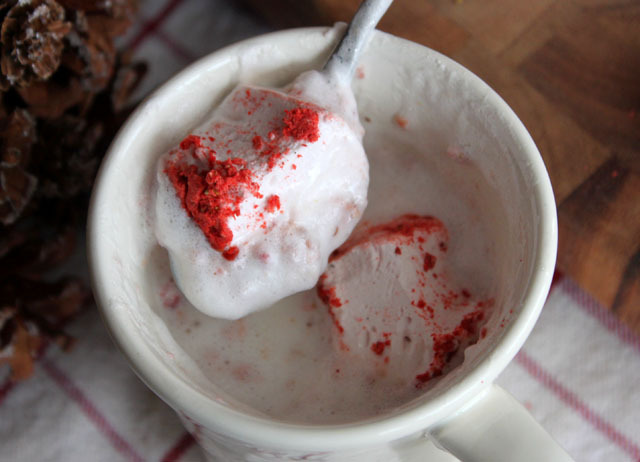 I did that very thing one morning, but instead of sweetening it up with some honey or chocolate, I used strawberry marshmallows for a creamy summertime flavor. 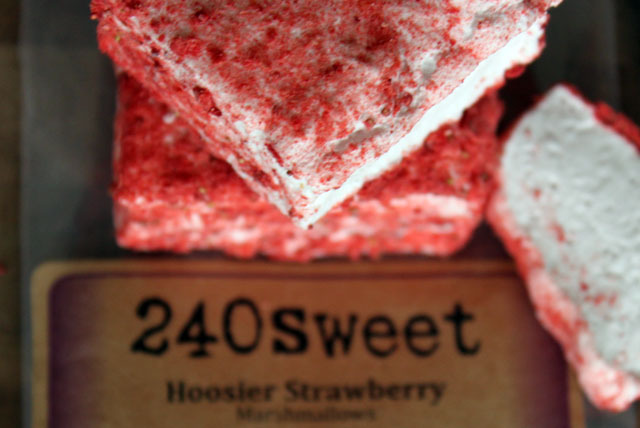 These were no ordinary strawberry marshmallows though, they were handcrafted, locally-sourced Hoosier Strawberry Marshmallows from 240sweet! * The strawberry marshmallow steamer cozied me up and took me back to late June in the middle of our ol’ family strawberry patch, trying to match a quart full of like-sized strawberries for my 4-H project (eating any and all “unsightly” extra-juicy sun-ripened ones in my bare feet). How it happened: I cut the mallows into fluffy sugar cube-lookin’ quarters. After the milk was heated through, I added 2 mallow cubes, heated the mix up again (~10 seconds microwave, 2 min. stovetop) and stirred. Then I added 2 more mallow cubes on top. *Saturday I hopped in the car with a good friend and traveled south to the sight of marshmallow magic. The 240sweet folks taught us all things mallow (I took snapshots when I wasn’t savoring freshly toasted samples–future post! ), and I brought home a few edible souvenirs. 240 sweets are everywhere…I would really like a bag or 3! Solid post and thanks for shareing. 240 is one of the wamest and classiest local businesses around. Glad you got to try them. agreed 🙂 I’m not sure one can go wrong with 240sweet!